I don't see any reason to change my count. The rally right after Friday's open to 10197 was a three wave move. I first thought that this had already completed wave 4 but the market didn't sell off from those levels and resumed its rally right before the close. Primary count is that the rally from 9919 to 1097 completed wave [w], the correction down to 10031 as wave [x] and the late day rally as a part of wave [y] which should complete a double zigzag. 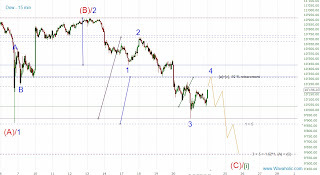 While second waves usually retrace 50 to 62 % of the first wave, fourth waves only retrace between 38 and 50 % of wave 3. 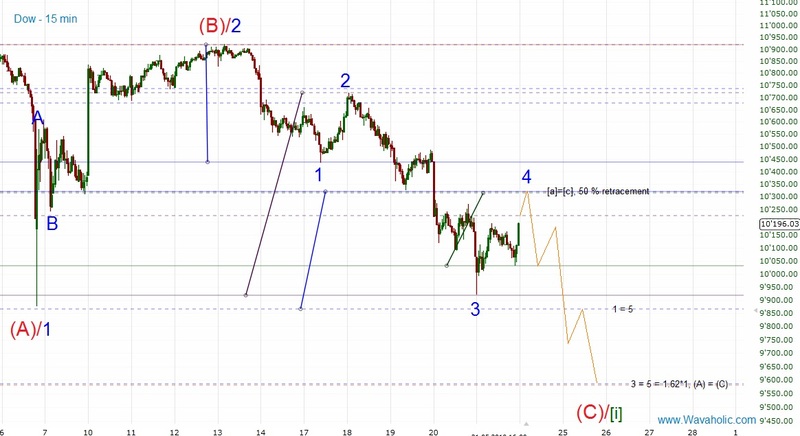 At the 50 % retracement level wave [w] equals wave [y] so this is my preferred target for this wave 4. The Dow shouldn't rally above 10436, the wave 1 low, because an overlap between wave 1 and 4 isn't allowed. Since almost every Monday was an up day and an inverse H&S was formed over the last days (best visible in the SPX) a rally is very likely tomorrow. Target for wave 5 could be 9600. At that level (A) equals (C) and 5 is 1.62 times wave 1. Edit: If we the Dow breaches 10031 and the ES 1068 wave 5 should be underway.